Hasina has sold her soul to Modi/India and they can take advantage of her and the situation to their hearts desire. Pakistan should vocally support BD if they elect to go to any world body to complain about the situation. Are Bhai, that project is to link all the Rivers of the India, so that in those areas, which have floods, the extra water could be diverted to those areas, where the extra water is needed, and will help in the inter river transportion. And in reality will help Bangladesh, and protect them from the floods, which disroyed the fields in the flood zone. It is not stopping the water which Bangladesh have the right. The river originates in China, where it is known as the Yarlung Tsangpo. It then flows through India and Bangladesh, before entering the Bay of Bengal. Part of the river’s basin is also in Bhutan. In India, it runs through six states in the country’s east and northeast covering a distance of about 570 miles. In parts of India, it is also known as the Siang and in Bangladesh, as the Jamuna. The river’s basin covers 580,000 square kilometers (224,000 square miles) through the four countries. The World Bank estimates that India and China occupy 50% and 34% of that area. The river is strategically important for China, mainly for its hydropower potential. The report said China has already built one hydropower dam on the river and plans to raise four more. China is worried about India’splans to build hydroelectric dams in the northeastern state of Arunachal Pradesh, whose border is disputed by both countries. China worries that plans to build on the river could “strengthen India’s ‘actual control’ over the disputed region and complicate border negotiations,” the report said. This could amplify tensions between India and China. The report recommends an increase in sharing of hydrological data by India and China. China does so during the flood season and itshould consider offering “real-time, year-round river flow data to India,” the report says. India should do the same. India should disclose how many dams it plans to build, the report said. When Mujib was killed in 1975, not a single person in BD cried for him. Haseena hasn't forgotten that, she is taking revenge from everyone she can think of. Sardarji, the problem is that India has a bad reputation, no one in the neighborhood trusts them and for very good reason. RBI Governor Raghuram Rajan has said India should restrain itself from being "too ambitious" at a time when the world is full of uncertainties and instead focus on sensible policies to ensure a sustainable economic growth. "Given great uncertainty about outlook and policies of others in these times, a country like India should try to take sensible measures without getting too ambitious, as we have done so far," Rajan said, delivering the Mahtab Memorial Lecture in Bhubanesw ..
"This will serve as a sound basis for strong and sustainable Indian growth as the world economy picks up," Rajan, whose remarks comparing the Indian economy with an one-eyed king in a blind world led to a controversy, added. The Indian government has been working hard to fasten the GDP growth and aspiring to take it to the double-digit mark from the current 7.5 per cent in the medium term. SQA: "not into Bangladesh and it's problems........care about Bengalis about as much as they care about Pakistanis.......none nada niet and I sugest other Pakistani's should get over it too"
We need to differentiate between Indian puppet Shaikh Hasina and the ordinary Bangladeshis. They should not be made to suffer for her sins. 1. The plan is a non starter, the amount of land that has to be acquired is humungous and given our travails with land acquisition, it is unlikely ever to be implemented. Plus, the cost is so large that it will bankrupt the govt. 2. The plan is a hare brained one. There are much better ways, short-term result oriented and low cost ways of drought proofing India - rainwater harvesting, watershed management, no till agriculture, cropping patterns (switching from paddy-sugarcane monocultures to more coarse cereals, pulses and oilseeds). "Sardarji, the problem is that India has a bad reputation, no one in the neighborhood trusts them and for very good reason." This coming from a Pakistani is bit rich, since even neighboring islamic countries have better relations with India than Pak. This coming from a Pakistani is bit rich, since even neighboring islamic countries have better relations with India than Pak." Same can be said about India. The smaller brotherly "Hindu" country has better relations with China than with India, they are always fearful of becoming the next Sikkim. The worry is of course the radicals' reaching the eastern border and the opportunity is to bring Dhaka closer to New Delhi than it is to Beijing for China has shown a determination in challenging India by encircling it through the smaller countries in South Asia. New Delhi needs to engage with Bangladesh for it poses a bigger security threat than Pakistan today. At the same time, it offers a huge economic opportunity to integrate South Asia like never before. IS has a better chance of reaching India via the eastern front The IS has a better chance to flourish in Bangladesh and enter India from the east for two reasons: first, the IS has a bigger challenge to reach India from the west owing to the presence of the Taliban in Afghanistan and Pakistan. Bangladesh, on the other other hand, is a more fertile territory for the IS to grow, thanks to the country's shrunk space for media and other freedom and the inability of the government to deal with the problem. 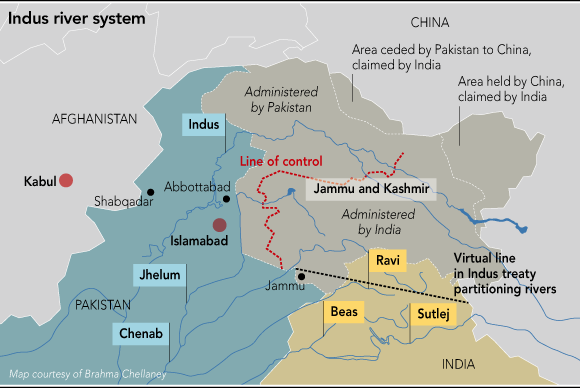 Secondly, India has a more clumsy border to the east which is also given lesser strategic significance compared to that with Pakistan or China. We have seen in the recent past how extremist elements have been entering easily in the border state of West Bengal and conducting sinister activities. If New Delhi doesn't act to tighten things up in the east, the potential of India-Bangladesh relations could not just be ruined but even India's internal security would be jeopardised.